Mainline Coaches of Bridgend has taken delivery of an EVM Avantgarde, based on the Mercedes-Benz Sprinter. 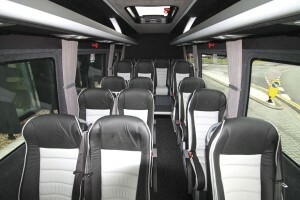 The minicoach’s power comes from a Euro5 516CDi 138bhp engine coupled with an automatic gearbox. It has a plug type door, an Eberspacher saloon air conditioning system, a Mercedes-Benz Sound 20 entertainment package, a recessed 15inch monitor and 16 EVM seats.